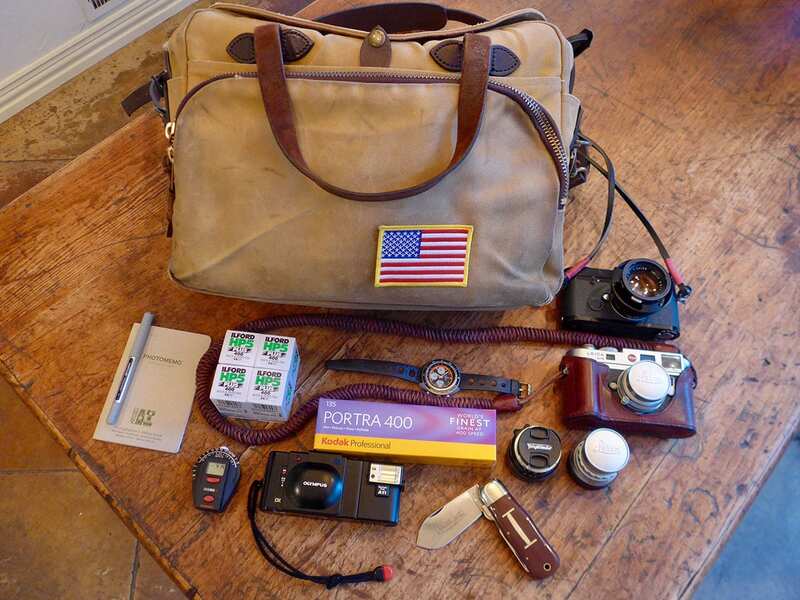 Kevin shares his with us his great studio style bag. 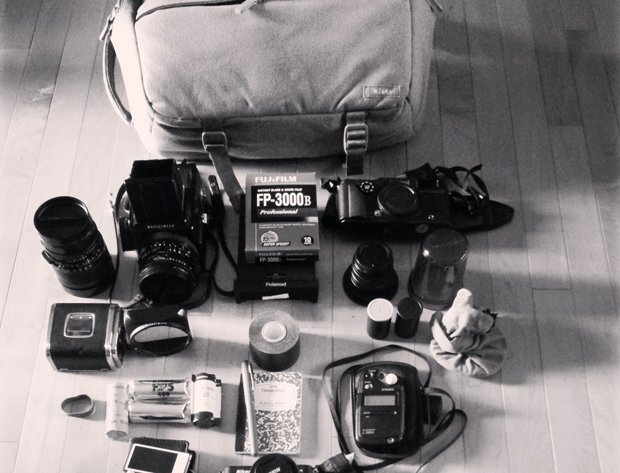 This bag has it all, including one of my favourites, the X-pan. Seriously, I love this camera, especially with slide film. What a beauty. Here is my bag. I’ve gone thru several bags trying to find the right one until I came across the Ari Marcopoolos bag. 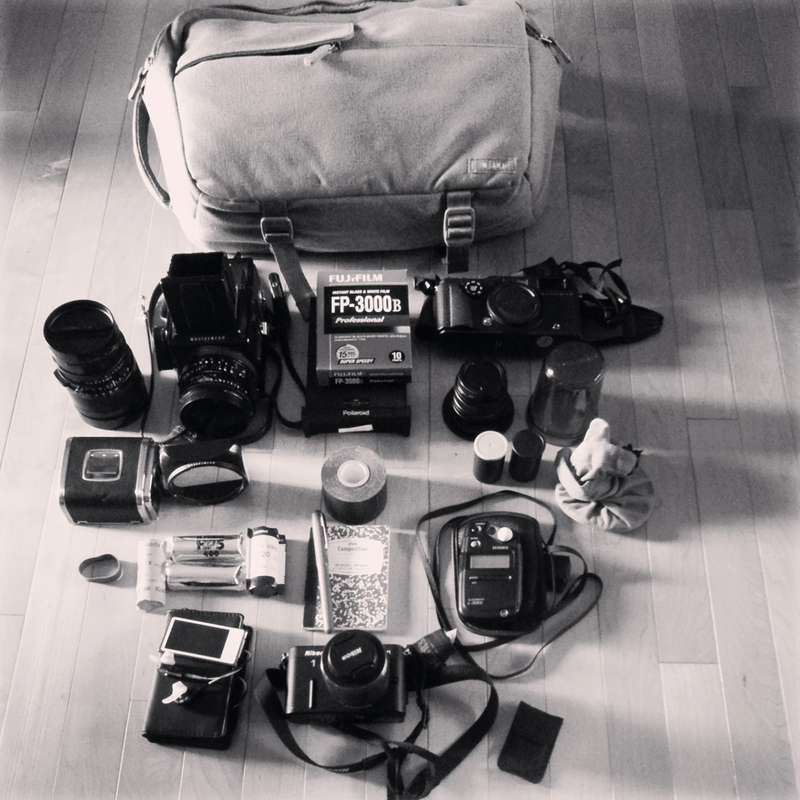 Every item in my bag serves a purpose be it I’m doing street, studio or travel photography. The only items missing b/c I couldn’t fit it all in the frame are my iPad and tripod. Starting in the far left corner is my baby that I primarily shoot with in the studio – my medium format camera, the Hasselblad 503cx with the 80mm and 150mm lenses, 2 A12 film backs, as well as a Polaroid back and a pack of instant Fujifilm for it. 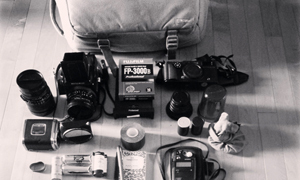 I have a 50mm lens but I’ve omitted it from the bag as I only use it when traveling the world. This is my go to camera for my studio work. 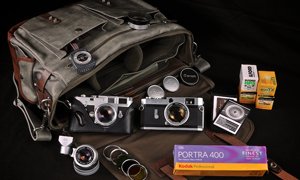 Along with that film, I have to have several rolls of 120 Ilford film and a couple of others for the ride. You’ll notice a roll of gaffer tape in the center of the photo as this comes in handy when setting markers in the studio and my mini notepad to jot down scenes, notes and the like. 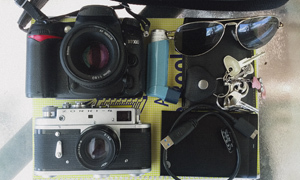 To the right of the frame I have my other baby, the 35mm Hasselblad Xpan with the 45mm lens and it’s protective carrying case, a couple of rolls of Ilford film and a bag to carry the spent film in. This is my go to camera when walking about a foreign land as I’m often prone to do. The light meter is a “just in case” for when using the medium format camera in the studio and sometimes when I need to gauge the light in my travels. Last but not least when I’m in the mood for normal or slo-mo video I pull out the Nikon N1 for when I’m recording a studio session for review or when travelling around the world like when I was in Tokyo earlier this year and just missed out on meeting the man behind this website (Found out about the site on my last day in Tokyo, but I’ll be back soon!). To the right of the camera in the pouch is its remote which comes in quite handy. Last but not least I can’t forget the iPod. Every photographer needs their theme music. I live in Rhode Island, I’m an amateur photographer and a teacher’s assistant for the Darkroom workshop classes at the New England School of Photography in the great city of Boston, Ma (Boston Strong!) – www.nesop.com – and am a frequent global traveler. My mentor is Nick Johnson who teaches the film photography classes at the school. These cameras have been to 6 of the 7 continents that I’ve been to. I can’t live without the Xpan, it has become my go to favorite when not in the studio. My next two film camera will probably be a Leica M6 for when I’m travelling the world and a 4×5 large format Shen Hao for when I’m in the studio. My website will be up soon – www.darktraveler.tumblr.com. Thanks for sharing your bag with us Kevin. 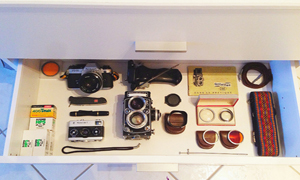 That X-pan is lovely. And you have the 35mm lens, wow. Cool stuff. Greetings Kevin Ron and Nancy from New Zealand here (from Yangshau and the Lin River a few years back) – you also stayed a night here and we met on Cape Cod. We are trying to get in touch with you, as we will be on the East Coast next September.